PT Bank BNI Syariah - BNI Syariah is a foremost financial services company in Indonesia with core business competencies in sharia banking industry. BNI Syariah provides a full-range of general banking services based on Islamic principles with financing business segments on commercial business, consumer and retail business, micro business, treasury and international business. PT Bank BNI Shariah is a member of state-owned lender PT Bank Negara Indonesia (Persero) Tbk (BNI Group). As today, BNI Group holds 99.99% shares in BNI Syariah. Other 0.1% remaining shares in BNI Shariah was owned by PT BNI Life Insurance, a reputable insurance company in Indonesia which majority owned by BNI Group. 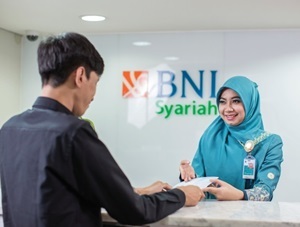 Domiciled in Jakarta, BNI Shariah offer services through 67 branch offices, 165 sub branch offices, 17 cash offices, 8 functional offices, 22 mobile services vehicles, 20 payment points, 202 ATM BNISyariah units, and 1500 outlets spread in all over Indonesia (as of December 2017). BNI Syariah's head office is registered at Gedung Tempo Pavilion 1 Jl HR Rasuna Said Kav 10-11, Lt 3-6. Jakarta 12950. BNI Shariah's performance in 2017 showed a positive results. BNI Syariah managed to record total income of Rp 307 billion in 2017. This number is up 10.83% year-on-year (YOY) from Rp 277 billion in 2017, according to information found in PT Bank BNI Syariah Annual Report 2017 as cited by JobsCDC.com. In 2017, total asset for the year achieved Rp 34,822 billion, that was 22.98% higher than Rp 28,314 billion total asset for the year booked in 2016. Total third party fund grew by 21.23% from the previous year, from Rp 24,233 billion to Rp 29.379 billion in 2017. Minimum S1 degree from an accredited university. Fresh graduate S1 candidates : maximum birth year in 1994 and thereafter. S2 or experienced candidates : maximum birth year in 1991 and thereafter. Preferably majoring in following disciplines : Informatics Engineering, Information System, Computer System, Informatics Management, Computerized Accounting, Electrical Engineering, Mathematics, Statistics, Physics Engineering, Electronics and Instrumentation. Minimum TOEFL score of 400 or minimum IELTS score of 5. Preferably have experience in handling project in the field of IT or digital. Integrity, have high communication skills and motivation. JobsCDC.com now available on android device. Download now on Google Play here. Please be aware of recruitment fraud. The entire stage of this selection process is free of charge. PT Bank BNI Syariah - Hasanah Development Program BNI Syariah February 2019 will never ask for fees or upfront payments for any purposes during the recruitment process such as transportation and accommodation.